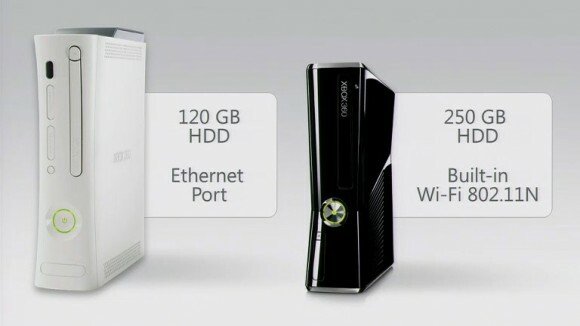 Following the release of the PlayStation 3 Slim, it was inevitable that Microsoft an XBox 360 model that bared the “Slim” moniker. And that they did, at E3 2010. Microsoft has unveiled it’s newest XBox 360 model which the company describes as “sleeker, smaller, whisper-quiet”. How whisper quiet is this new unit exactly? Shacknews reports that it’s “pretty damn quiet.” The new optical drive makes very little noise compared to the current (and as of today outdated) models. What’s new with the 360? A larger diameter, slower RPM fan for better cooling, a smaller form factor (obviously), new touch sensitive buttons, three USB ports, an optical S/PDIF port, a dedicated Natal (now known as the kinect) port and finally, built-in Wi-Fi with support for 802.11n. The new model is available now for $299. The unit includes a 250GB hard drive and built-in WiFi-n. No word if the new model carry HDMI cables in the package though.